Did a behavior evaluation yesterday and guess what happened? The Amazing Dog Training Man gets bit. So much for being the “highly skilled, competent dog trainer with cat like reflexes” like I wrote in yesterday’s email. It was a rookie mistake and I should have known better. 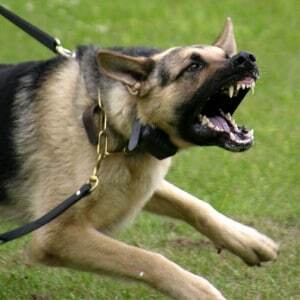 The problem with working with aggressive dogs is that you need a certain level of confidence. And that confidence can get you in trouble if you are not careful. I had evaluated the dog and we were walking back into the house. I thought the dog was secured in the yard off the deck we had been working on. The dog came back onto the deck and made a beeline for me. As I backed away he made his move and charged me, biting me on my thigh. I’m going back on Friday to work with this dog. I’ll be teaching this dog that biting is UN-acceptable behavior, not allowed. This will be accomplished by stopping the behavior and then working on associating strangers in a positive way. I know that my emails are light and I hope to give you a chuckle as you read them, but I am very serious about dogs that bite. This dog is now in a lot of trouble. If I can’t help this dog, I would have to recommend euthanasia. A dog with a bite history can’t be adopted out to another person or family. Dog bites are a HUGE problem and the right way to deal with them are to shut them down. A dog has to learn that biting is a totally unacceptable behavior and ignoring the behavior, trying to redirect or “waiting for the right behavior” won’t work. The word “NO” and a negative consequence has to be used to stop the behavior. Then when the dog is not being aggressive you can switch to rewards and make new associations. If your dog is ever showing any signs of aggression, get help fast. Anyway, I’ll let you know how it goes so stay tuned. BTW – if you’d like to learn more about aggressive behavior or how to teach your dog “NO,” check out the Dog Training Inner Circle. You can become a member for just $1.00!